oversees the graduate choral conducting program. North Dakota, Ontario, South Carolina, South Dakota, Texas, Virginia, Washington,Wisconsin and three times to the Sultanate of Oman. 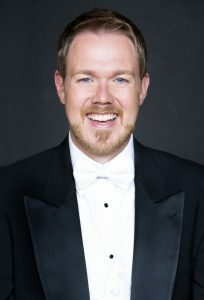 He has conducted All-State Choruses in Alabama, Colorado, Florida, Kentucky, Minnesota, North Dakota, Oregon,South Carolina, South Dakota, Virginia and Wisconsin as well as the British Columbiaand Manitoba All-Province Honour Choirs. Additionally, Christopher led the All-Northwest Mixed Choir in 2015 and ACDA Southern Division Men’s Honor Choir in 2016. Most recently, Christopher travelled to South Korea to headline the 35th AnnualInternational Symposium on Choral Music and will travel to Berlin in March 2018 to lead the AMIS Men’s Honor Choir. Christopher has produced more than forty arrangements and compositions for mixed, men’s and women’s choirs. His works are published by Augsburg Fortress, earthsongs, Hal Leonard, and Aspen Hill Music, a publishing house Christopher co-founded with his wife Nancy in 2013. His latest commission, Do Not Ask Me to Remember, premiered a tthe 2017 National Conference of the American Choral Directors Association in Minneapolis, Minnesota.